To meet today's complex and ever-changing business demands, you need a solid foundation of compute, storage, networking, and software resources. This system must be simple to deploy and be able to quickly and automatically adapt to changing conditions. You also need to be able to take advantage of broad expertise and proven guidelines in systems management, applications, industry solutions, and more. IBM® PureFlex® System combines no-compromise system designs along with built-in expertise and integrates them into complete, optimized scalable solutions. With IBM Flex System® Manager, multiple solution components that include compute nodes, network and storage infrastructures, storage systems, and heterogeneous virtualization environments can be managed from a single panel. 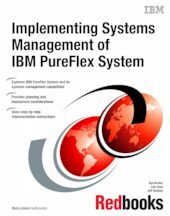 This IBM Redbooks® publication introduces IBM PureFlex System and IBM Flex System and their management devices and appliances. It provides implementation guidelines for managing Linux kernel-based virtual machine (KVM), IBM PowerVM®, VMware vSphere, and Microsoft Hyper-V virtualization environments. This book is intended for the IT community of clients, IBM Business Partners, and IBM employees who are interested in planning and implementing systems management of the IBM PureFlex System.